Serve a berry pudding with a lot of refined sugar. Trust me, the 10-month-olds in your party will LOVE this. 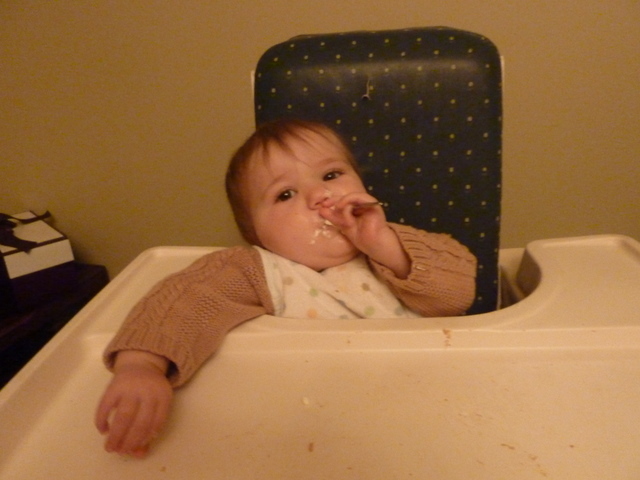 In fact, mine screamed, banged her hand on the table, and occasionally grabbed my arm while screaming and banging if I didn’t stuff berries in her mouth every 15 seconds. Unless you are suffering from a sinus-pressure headache (which I was) the evening can be rounded out with stately Pilgrim dancing. Jeff’s History Face was on full throttle. To tell the truth, I was rather impressed by the setup. They even had a calligrapher on hand — a CALLIGRAPHER! — to write out whatever you wanted on little slips of paper. In retrospect, I regret not taking the chance to get something like “PWNED” written in swirly whirly script. In other news, during Thanksgiving weekend, the kids were taken to three movies in three days. All Hail the Muppets. For them, I am truly thankful. 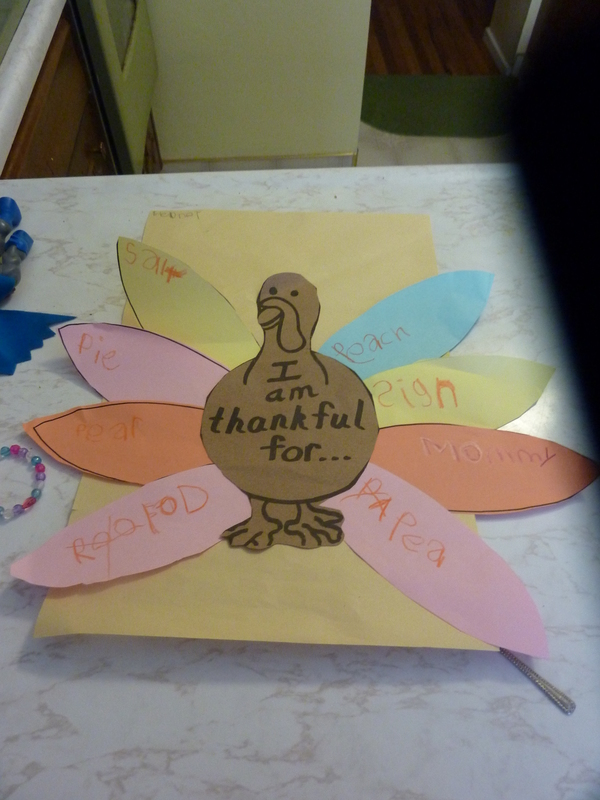 It sounds like kindergarten hasn’t changed much since I was a kid, in some ways. Love that bison piggy bank. 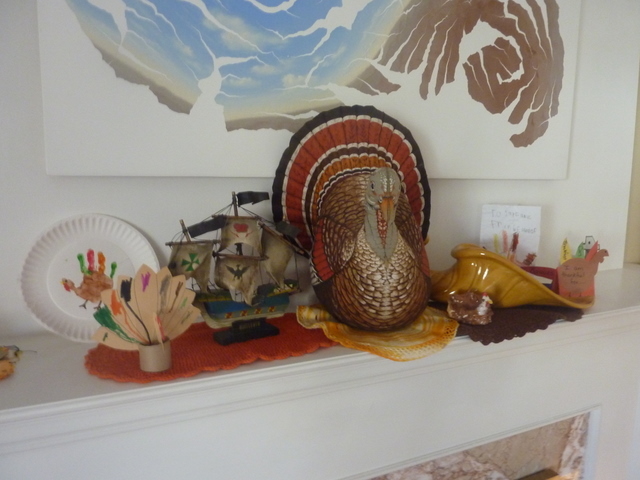 See the funny-shaped turkey in the center of the table? Brian and I discovered a roasting method called “spatchcocking” — where you cut the spine out of the bird, then press it flat. Because the turkey is much thinner this way, it takes much less time to roast — only about 70-80 minutes. This ensures moist, tender meat and a crispy skin. Brian loves this method, and rubbed a butter-rosemary mixture all over the meat before roasting, which I found fantastic. After dinner we played games — a literary variant of Balderdash called Liebrary (in which you make up the first lines of real books, then guess which one is real), and a marathon game of dominoes (dominoes being one of the few games the kids find just as entertaining as the adults). Jeffrey got bored of games after just one round of dominoes, and wanted to go off to play by himself. In his social skills class, we’ve learned that this isn’t behavior we should encourage; the rule now is that Jeffrey doesn’t have to play the game, but he can’t go off by himself, either — he has to stay with the group. Since Jeffrey had spent part of the weekend watching the BYU-Utah football game on television with Brian, he decided to stay with us and “call” the dominoes game like a sportscaster would. 69. The Macy’s Thanksgiving Day Parade. Yeah, it’s cheesy and commercial, but for some reason I just love it. How can a person have something against giant puffy balloons? 70. Hoberman Spheres. The very cool, very fun 21st-century version of a Slinky. 80. Vintage Fisher Price Little People. 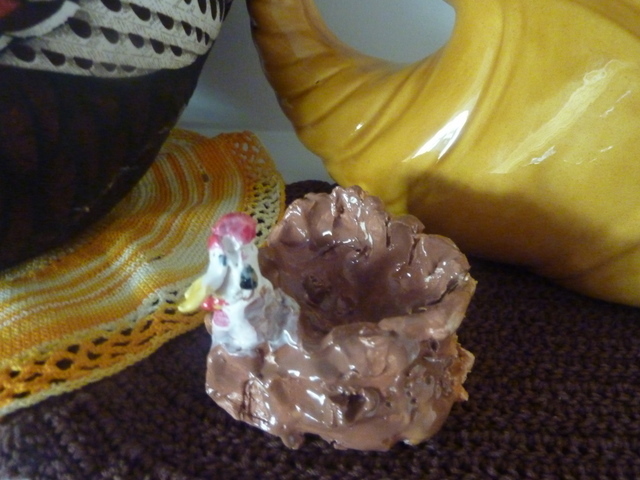 I love collecting them from thrift stores, my kids love playing with them. My favorite has to be the Merry-Go-Round. William loves putting a boy Little Person inside it, then saying “that’s me!” every time it comes around. 82. My mother’s “secret” recipe for potato rolls. They are excellent for dunking in hot cocoa or making sandwiches with leftover turkey. 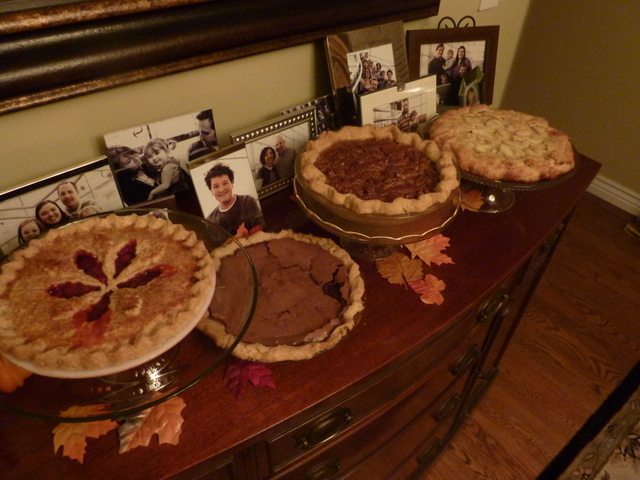 I made three dozen of them today, and the first dozen disappeared within 15 minutes of coming out of the oven. 85. Baby boy bellybuttons. I have a vintage 2007 model. They are so choice. If you have the means, I highly recommend picking one up. And then blowing bubbles all over it. 88. Today all the girls in Eleanor’s dance class got to wear “Ginny dresses,” these long billowy dance outfits that look like frilly old-fashioned nightgowns and were designed by the founder of the dance school. The skirts are generous and swirl out when the girls twirl and skip. 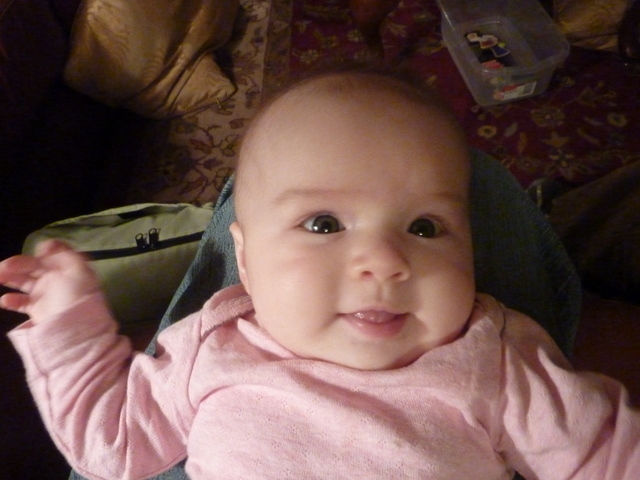 Eleanor’s was lavender-colored and puffed out like a marshmallow while she danced. It was so sweet! 34. William’s hilariously adorable mispronounciations. We even made a SONG about it! 37. That one guy I knew in high school who loved the Hitchhiker’s Guide to the Galaxy so much that he actually CARRIED A TOWEL AROUND WITH HIM IN HIS BACKPACK. And by “backpack,” I mean LEATHER BRIEFCASE. 48. 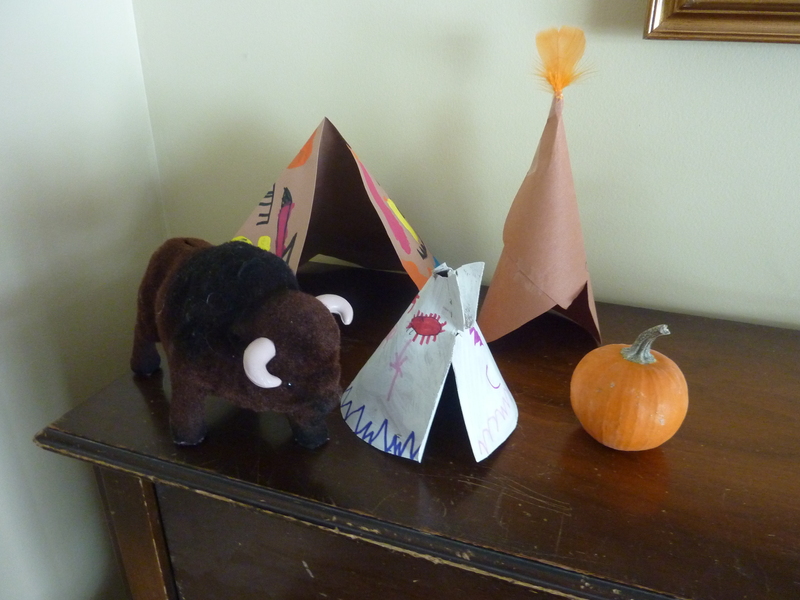 All three of my kids came home with paper tipis they made as part of a unit on Native American lifeways. They are all sitting on the piano together, a little paper village, and Eleanor also dug up her bison-shaped piggy bank and set it beside them, like it’s the village pet or something. 55. Oh, come on. You have to try the St. Andre’s triple-cream brie. It tastes like butter, but in all the right ways. When the girl returned, some hours later, she carried a tray, with a cup of fragrant tea steaming on it; and a plate piled up with very hot buttered toast, cut thick, very brown on both sides, with the butter running through the holes in it in great golden drops, like honey from the honeycomb. The smell of that buttered toast simply talked to Toad, and with no uncertain voice; talked of warm kitchens, of breakfasts on bright frosty mornings, of cosy parlour firesides on winter evenings, when one’s ramble was over and slippered feet were propped on the fender; of the purring of contented cats, and the twitter of sleepy canaries. 60. Johnson & Johnson’s no-tears baby shampoo. I love bathing my kids in it, and the way it makes their hair smell afterwards. On bath nights I end up sniffing their heads so much that they complain. 62. This German drink my family used to get in gasthouses when we were stationed overseas. It’s made with one-half Fresca, one-half Coca-Cola, and for the love of me I can’t remember its name, but trust me, it’s delicious. See? 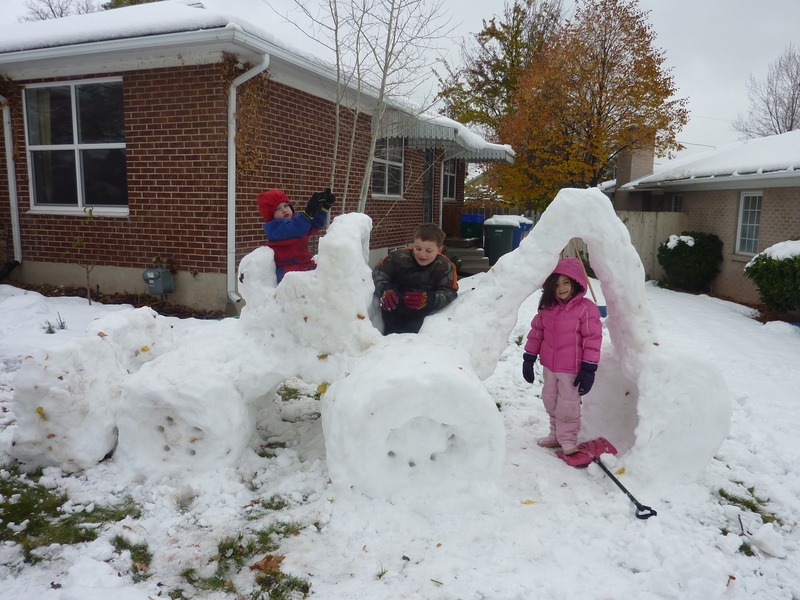 It’s a backhoe made of snow! William is overjoyed to have his very own toddler-sized “digger.” He’s spent long hours sitting in that little seat on top, singing “Dig, dump, dig, dump” over and over again. The “Thanksgiving” wreath that I procrastinated putting up until today, which means it will get a whopping 6 days on the door until we haul the Christmas decorations out this weekend. The way Jeffrey strutted around Great Clips after getting his haircut on Saturday. He was thrilled because the stylist put a palmful of gel in his hair to “spike” it. Mitochondria. They are completely separate organisms, yet they live in our cells and help them make energy. And in Madeline L’Engle’s A Wind in the Door, they are also hyperintelligent creatures who can TALK to GALAXIES. People who think that knitting could be the “new” anything . . .
Jeffrey just lost his two front teeth. I’m teaching him the “All I Want for Christmas is My Two Front Teeth” song, and it is more adorable than I can say. Jeffrey’s current obsession with Roman soldiers. They were paid with silver coins called denarii. What? YOU DIDN’T KNOW?!? 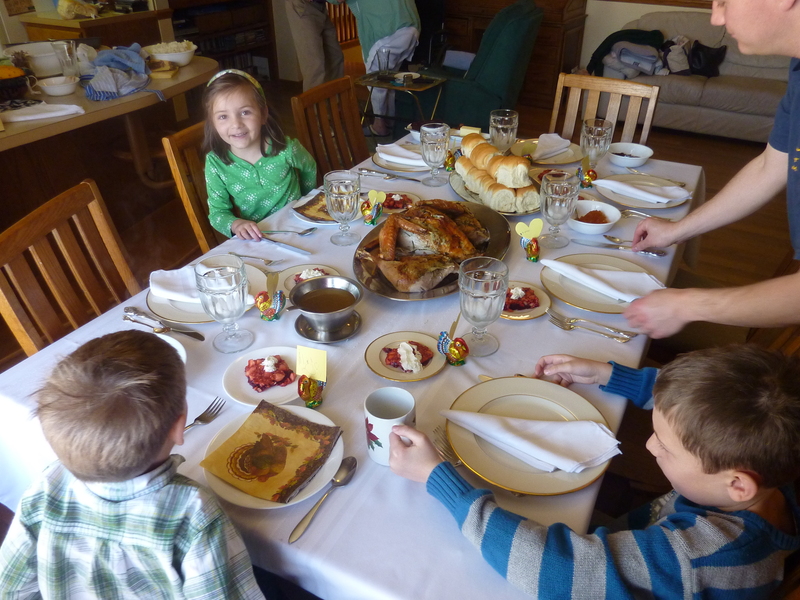 This was the first year that my parents told me not come to their house for Thanksgiving. So . . . dinner in Provo. Brian and I were in charge of making my family’s luscious secret-recipe rolls, and acquiring a fancy cheese plate. Oooh, fancy cheese! My heart rejoiceth at the thought of thee! Cheese is REALLY something to be thankful for, no? Brian’s family had never had a cheese board as part of Thanksgiving; Brian and I got the idea beacause our friends from Pittsburgh, the Seppis, always began holiday meals with one. Morbier — this is a cheese with two layers, separated by a fine border of ash. The bottom part is from the morning milking, and the top from the evening milking. It was voted the favorite. Mimolette — a carrot-orange, medium-strong hard cheese. We bought it for color. Onetic Tomme Noir — a mild white cheese with a black rind. I found the day after that it makes the best turkey sandwiches. Stilton — the classic British blue cheese. Sage Darby — white and green cheese that we bought again for color. I think the sage flavor was a little overpowering. Cahill’s Porter – a white cheese with chocolate-brown marbeling, it’s made with beer. Its dramatic coloring is in weird contrast to its mild flavor; it was good, but we were disappointed. And yeah — there was turkey, sweet potatoes, and whatnot. We stayed up late playing “Sets & Runs,” which I believe is not so much a game as a way to torture your mind. And much thankfulness was proclaimed by all.